With a distinctive sound “steeped in the tradition of jazz and charged with the energy and experimentation of modern music”, Vancouver native Perry White’s staggering list of career credentials ranges from long-time membership with ‘The Shuffle Demons’ to playing with ‘The Boss Brass’, the Vancouver Ensemble of Jazz Improvisation, Dave Young, CD 9, John MacLeod Big Band, Kevin Breit, Holly Cole and even the TSO as well as countless other jazz bands and ensembles. 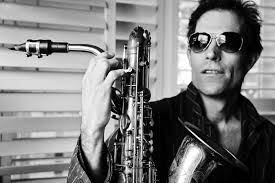 He has also been the recipient of many awards including a Juno, Best Film Score at the Halifax Film Festival and four times the Jazz Report’s Best Baritone Sax in Canada. As well as live gigs, Perry also works behind the scenes on film and television scores and backing up artists on recording projects. His expressive tone and lyrical approach to playing the entire family of saxophones have kept him busy performing around the world with the ‘crème de la crème’ of the international jazz roster for over three decades. Perry has taught at the University of Toronto, York University, Humber College, and given workshops in over 15 different countries while on tour around the world, including in Canada at Saint Francis Xavier University in Nova Scotia, and Capilano College in Vancouver, BC.